State Bank of India (California) is a full-service financial institution, offering an extensive portfolio of lending solutions as well as comprehensive consumer, business, and international services. The Bank was established in 1982 as a California State Chartered Bank under the Department of Financial Institutions in Los Angeles, California. At present, we have a total of seven branches throughout California with our headquarters located in Downtown Los Angeles. 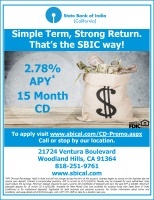 At State Bank of India (California) (SBIC), each one of us is committed to offering you only the best because we believe that your success is our success. Our range of highly personalized services is tailored to meet your needs. We are sure your experience with us will be a memorable one. We thrive on building long-term relationships with our clients, which is deeply rewarding to each one of us at SBIC. We give every individual the highest priority and constantly seek better ways to serve our customers. Established in 1982, SBIC is a fully owned subsidiary of State Bank of India, one of the largest banks in the world and a Fortune 500 company, with controlling ownership by the government of India. Through the support of our clients, SBIC has grown steadily over the years and we expect to continue this trend in the coming years. We have nine branches located throughout California and one in Washington DC. We are ready to assist you today!